The context and history of the Arena Chapel is as important as the paintings frescoes by the artist Giotto inside of it. 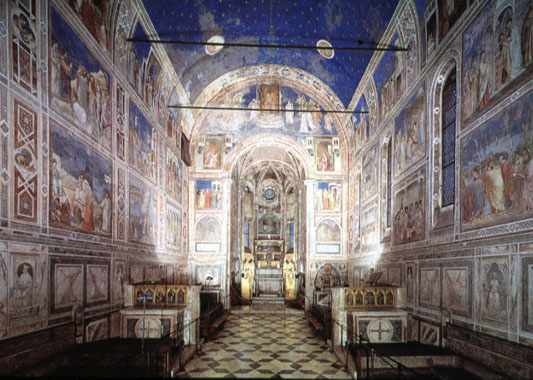 The Chapel was built as a kind of “indulgence” by the grandson of the money lender from the Scrovegni family. An indulgence is usually some sort of gift made to the church in order to forgive a sin that a Catholic has committed during their life. The person who pays for the indulgence is asking that the church and the clergy intercede or indulge the request of the patron to forgive sin on behalf of themselves or someone they want to rescue from hell. 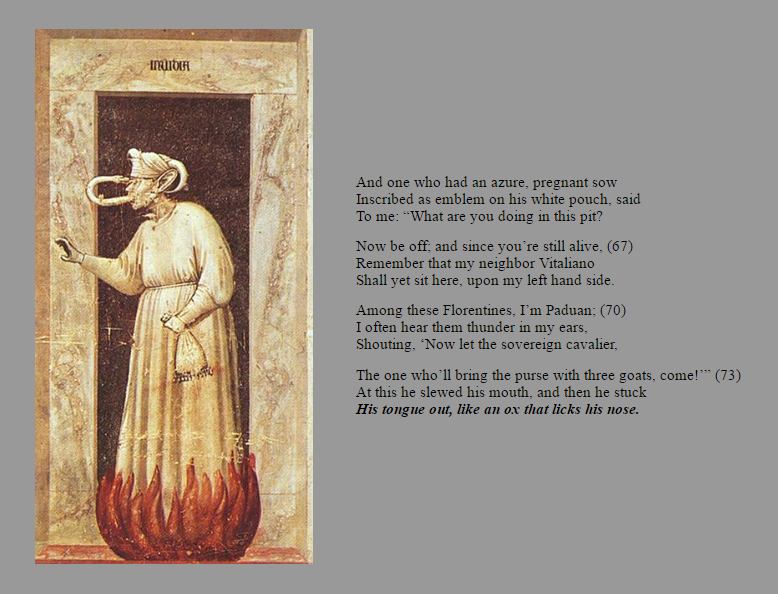 The Scrovegni family lived in a town called Padua in Italy during the 12 and 1300s. The family was wealthy because they made their money by lending money at an interest rate. Unfortunately, moneylending was illegal according to the Catholic faith at this point in time and therefore anyone who indulged in moneylending was considered to be committing a mortal sin. One that might send them to hell when they were judged by God after their death. The Chapel and the decorations inside of it were designed as an indulgence to relieve the grandfather of his sin. An interesting fact is that the Scrovegni family is mentioned by Dante in his poem “The Divine Comedy,” in which he places the grandfather in hell. The interior of the Chapel is decorated with scenes that represent the lives of Jesus and his family. On one of the walls is a large depiction of a scene referred to as the “Last Judgment.” Underneath all of the scenes are a series of illusionistic frescoes, (paintings done on plaster) that represent virtues and vices. The Chapel and the paintings inside of it are arranged almost like a large comic book because they are set up in a chronological order with frames around them. The physical qualities of the fresco and how they are organized are some important ideas because they relate to Italian Gothic and Renaissance painting and are an excellent example of how many of the other churches and palaces were decorated. 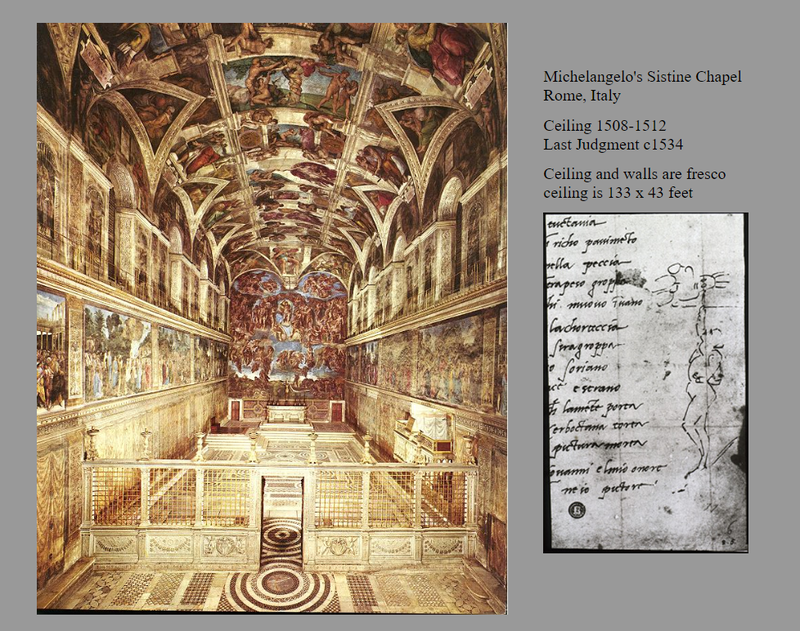 In particular it also relates to Michelangelo’s paintings in the Sistine Chapel. In my studies of Giotto’s paintings, I’ve come across some conflicting information in which they suggest that Giotto’s paintings both in Padua and in Assisi were not executed in what is called a true buon fresco style. 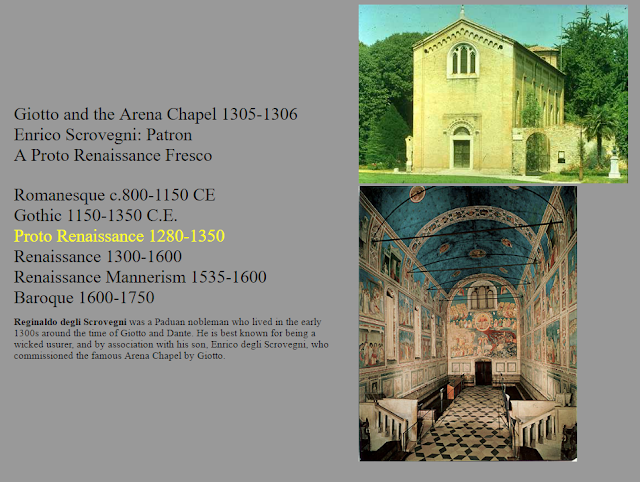 It’s important to understand the difference between different fresco styles because many of the paintings done throughout the Gothic and Renaissance periods were executed on plaster walls. 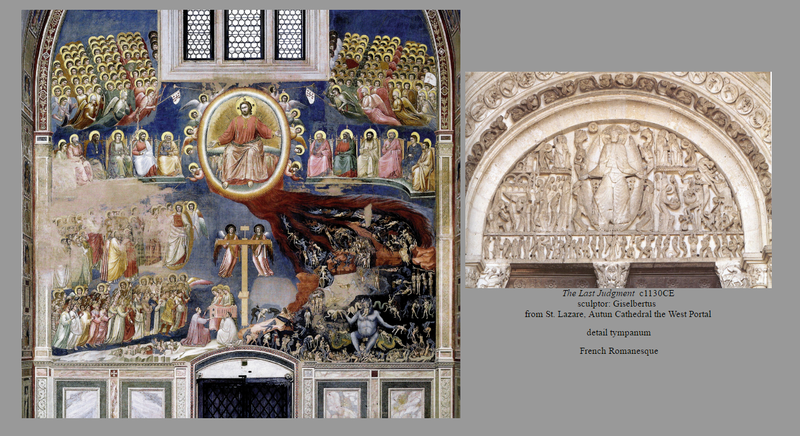 Here’s an analysis of what fresco painting is. Fresco is a term that literally means "fresh." 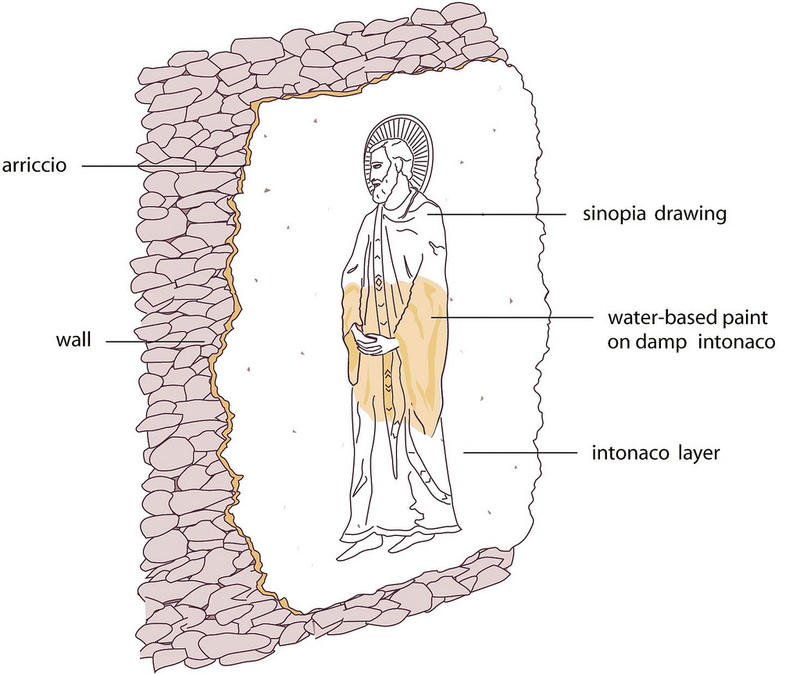 There are two kinds, “buon fresco” and “fresco secco.” This painting painting is made by coating a wall with plaster and while the wall is still damp, ground up pigments are mixed with water and lime and painted on the wall. The paint soaks in and literally stains the wall up to a half an inch and becomes permanent. This is called “buon fresco” (good fresh). Details with more expensive colors (such as blue made from lapis lazuli) are added with tempera paint (egg yolks and glue) when the fresco is dry. This is called secco fresco (dry fresh). 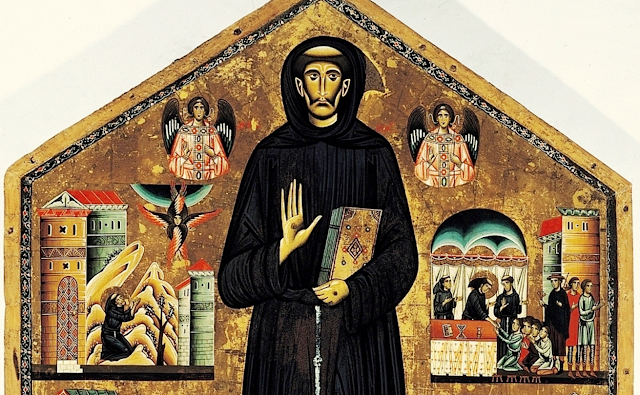 One of the sources that I’ve come across, who was a speaker at the Legion of honor Museum in San Francisco, stated emphatically that the frescoes in Assisi were painted in the fresco secco style and she also suggested that the frescoes in Padua were also painted this way. However, when one looks at some of the frescoes it does appear as if there are the daily sections called “giornata” in some of the frescoes. Mainly because one can see outlines around some of the figures. 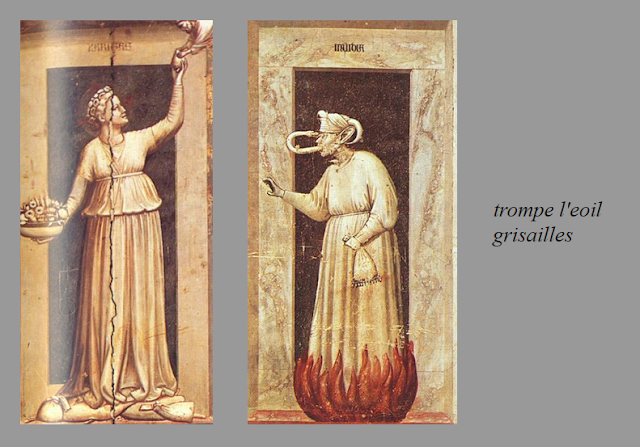 Some of the important things about the interior frescoes of the Arena Chapel, are in how Giotto depicts or paints human anatomy, light, and the illusion of space. 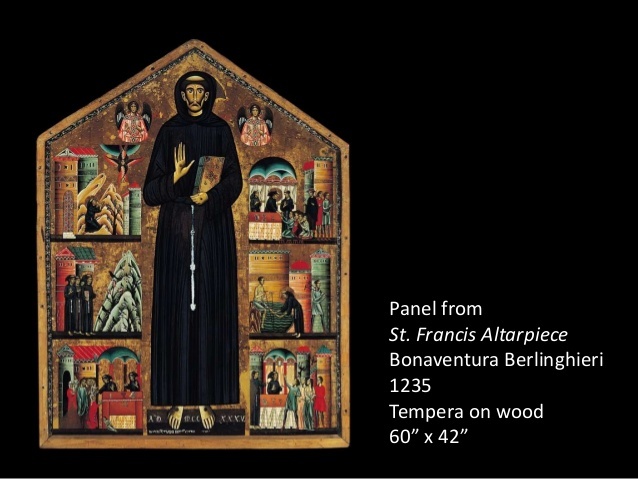 The anatomy of the majority of the figures is different from earlier paintings and earlier traditions such as the Gothic painter Bonaventura Berlinghieri in his painting of St. Francis. Berlinghieri’s anatomy conforms to an earlier tradition called the “maniera greca.” This is a Byzantine style that seems to be intentionally unrealistic. 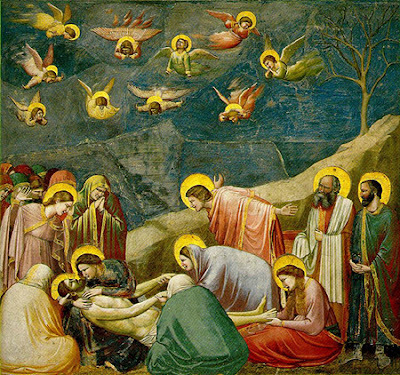 In Giotto’s paintings Giotto’s anatomy for the figures is more proportional than the earlier styles. Giotto’s paintings look particularly more realistic than most of the other painters who came before him as well as many of his contemporaries. The head is in proportion to the body and the poses of the bodies are very realistic and show a variety of views of the body. 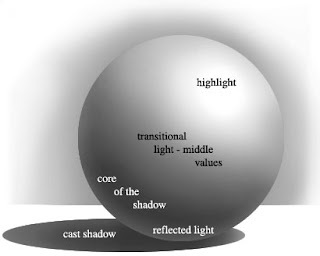 He also lights the figures with consistent shading which is referred to as “chiaroscuro” which literally translates as light and shadow in Italian. The drapery also describes the anatomy of the figures underneath the clothing. 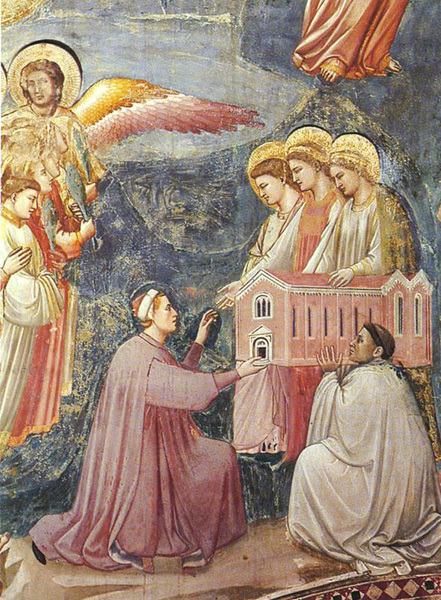 The other thing that Giotto does is he seems to create space in how he renders the size of the figures when compared to the buildings and also in relationship to one another. The figures are overlapped in a reasonable way which seems to look fairly realistic. Elements of this are that some of the figures even hide other figures behind them, something that would not have been done in earlier periods. The buildings seem to be consistent backdrops that are pretty much in proportion to the figures in front of them. The buildings are also lit with the same light that passes across the figures before them. The arrangement and organization of the series of frescoes in the interior of the Chapel are designed to amplify many Christian and Catholic concepts. 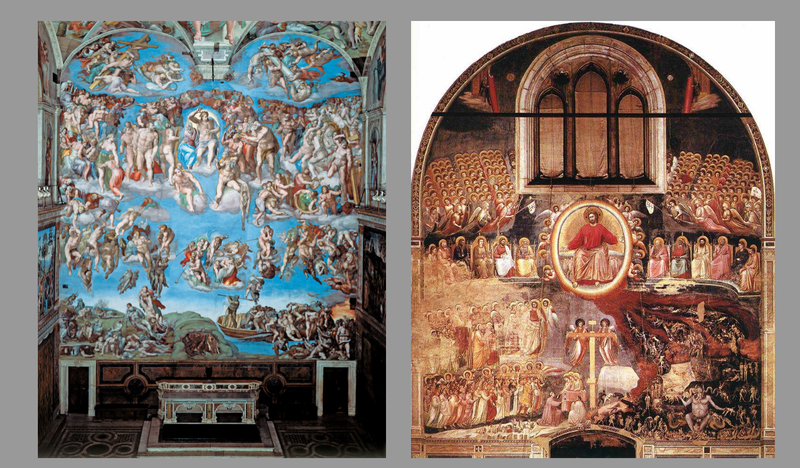 One of the more important concepts that the organization of the fresco seems to indicate is a type of hierarchy or order of importance of some main ideas concerning morality and Catholic/Christian values. 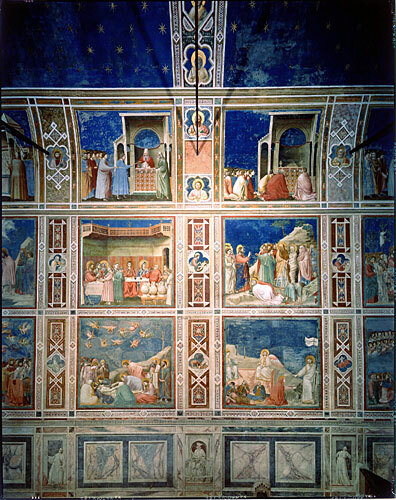 At the base of the frescoes are a series of paintings that are done to look as if they are made of marble and they are painted in a limited palette of colors that is referred to as “monochromatic.” The term monochromatic literally means one color, in this instance we see them as shades of browns. These monochromatic paintings are painted also in a style that is meant to fool the eye into believing that they are three-dimensional. The French term for painting that is meant to fool the eye is called trompe l’oeil. These trompe l’oeil paintings underneath the episodes of the life and times of Jesus and his family are meant to be foundational ideas placed at the foundation of the building. They represent various sins as well as virtues or positive qualities. Arranged above the trompe l’oeil paintings of virtues and vices are the life and times of, Jesus, his parents, and his grandparents. They are arranged in chronological sequence. A chronological sequence is basically in the order in which the events unfolded. This means that the upper panels represent the life and times of Jesus’ grandparents and the scenes flow into the life and Times of Joseph and Mary. 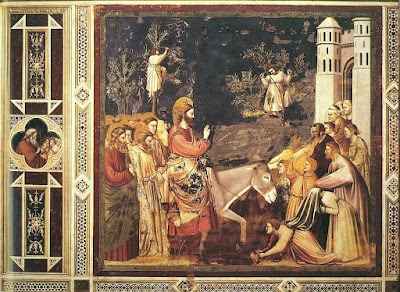 On the same level with the viewer, and slightly just above eye level are the most important scenes which represent the life of Jesus. 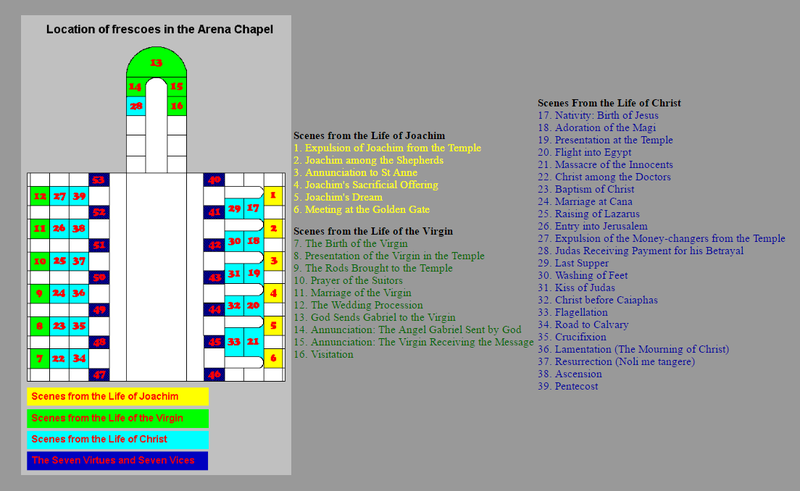 In this way, the panels or pictures that depict the life of Jesus are sandwiched between his parents and the foundation of virtues and vices that any Catholic should know. Giotto probably did this on purpose both to highlight the importance of the lessons the life of Jesus teaches Christians, but also to make them more visible physically. 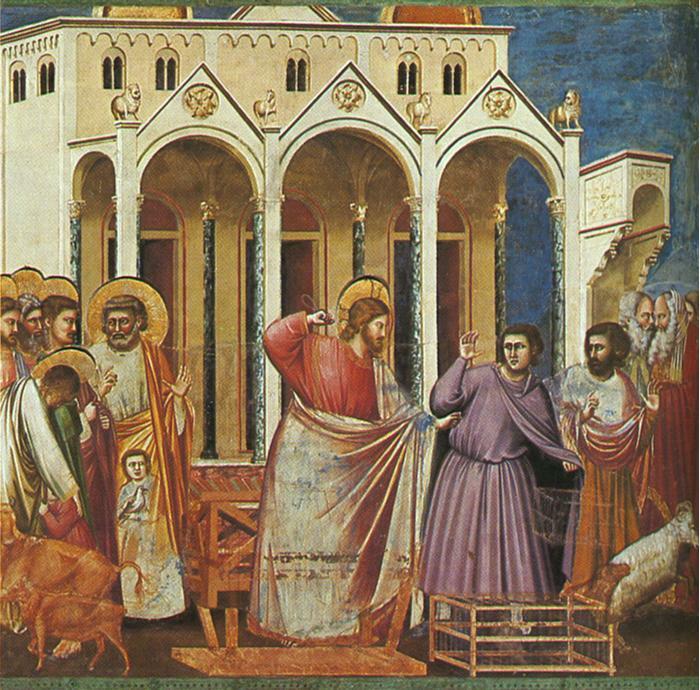 The take away from this analysis is that Giotto’s paintings in the Arena Chapel are groundbreaking in terms of how he painted people, how he painted space, and conceptually ideas concerning Catholic moral values concerning moneylending, forgiveness, redemption, and basic morality. The way in which he does this indicates a rise in critical thought because of the originality of his visual and conceptual vocabulary.